Tue., April 3, 2018, 11:06 a.m.
SAN ANTONIO – Villanova was clearly the college basketball best team in 2017-18, romping through the NCAA Tournament, capping it rout over Michigan in the title game. Now depression sets in for college basketball fans. It’s seven long months until the next game. We’ve got something to (hopefully) tide you over: A way-too-early poll for next season. 1. Duke. Marvin Bagley III and Grayson Allen are gone, Wendell Carter Jr. and Trevon Duval could join them. Even so, there’s enough coming back and Coach K has another stellar recruiting class coming in, headed by dunking dynamo Zion Williamson. 2. Kansas. The Jayhawks reached the Final Four in a season they weren’t even supposed to win the Big 12 title. Even with Devonte’ Graham gone, there’s plenty coming back – especially if Malik Newman remains in Lawrence – and more five-star help on the way. 3. Villanova. A lot will depend on whether Jalen Brunson, Mikal Bridges and Omari Spellman leave for the NBA. Either way, the Wildcats will be reigning champions and have breakout star Donte DiVincenzo. 4. Kentucky. As is always the case, there are lots of decisions to come out of Lexington. Get a few of their players back, the talented Wildcats and coach John Calipari will no longer be the youngest team in the game. 5. North Carolina. The losses of Joel Berry II and Theo Pinson will be tough. The addition of five-star freshman Nassir Little as part of UNC’s best recruiting class in years with Luke Maye, Cameron Johnson and Kenny Williams will keep the Tar Heels among the elite. 6. Gonzaga. 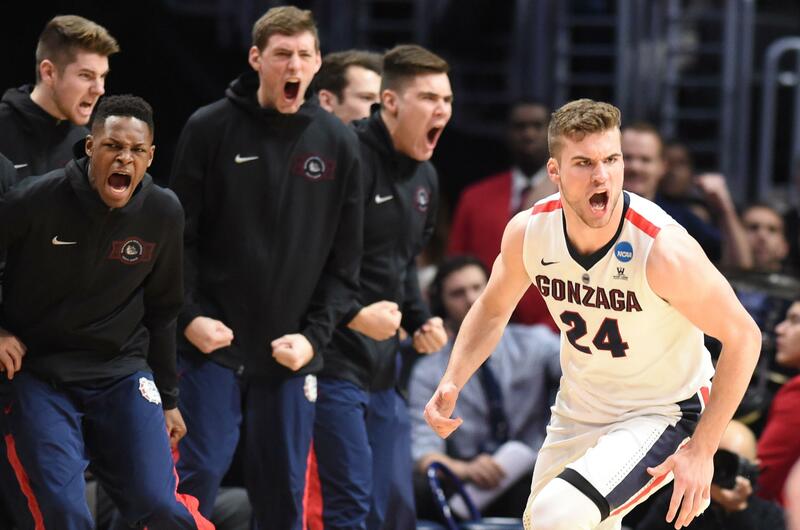 The Zags have a strong core coming back in Zach Norvell, Rui Hachimura and Killian Tillie. The addition of San Jose State transfer Brandon Clarke gives them a defensive presence. 7. Auburn. The Tigers won the Southeastern Conference regular-season title and have nearly everyone coming back. A deep March run could be on the horizon. 8. Virginia. The loss to No. 16 seed UMBC stings and the Cavaliers will surely use it at motivation. There’s also a nice core of players coming back, even with the departures of Devon Hall and Isaiah Wilkins. 9. Tennessee. The Vols were one of the nation’s biggest surprises in 2017-18 and have nearly everyone back, including SEC player of the year Grant Williams. 10. Nevada. The Wolf Pack took a big step forward in coach Eric Musselman’s third season. Another one could come next year with twins Caleb and Cody Martin back with more transfers on the way. 11. Michigan State. The loss of Miles Bridges and potentially Jaren Jackson Jr. is tough, but Cassius Winston could emerge as a Big Ten player of year candidate. 12. Louisville. Former Xavier coach Chris Mack inherits a lot of talent and he’s been hitting the recruiting trail hard. Expect a bounce back from the Cardinals. 13. Oregon. The Ducks could be looking at a return to the NCAA Tournament with a top-five recruiting class, headed by big man Bol Bol, joining Payton Pritchard and Troy Brown. 14. Michigan. The national runner-up may lose Moe Wagner and Charles Matthews to the NBA draft. If those two return, No. 14 could be a bit low. 15. Kansas State. The Wildcats are expected to have everyone back from a team that reached the Elite Eight. 16. Virginia Tech. Losing Justin Bibbs is tough, but Buzz Williams has the type of roster that could make some ACC noise. 17. West Virginia. Jevon Carter’s graduation may be the biggest blow any team takes heading into next season. But the Mountaineers always play tough and Bob Huggins always wrings out the best in everyone. 18. LSU. Will Wade signed the type of recruiting class that can be an immediate course changer. 19. Maryland. Some key losses, but also some key returnees to team up with a strong recruiting class to potentially keep the Terps in the Big Ten race. 20. Mississippi State. The Bulldogs won 25 games last season and have talent across the board for 2018-19. 21. Florida. The Gators lose a lot, particularly point guard Chris Chiozza, but Mike White has a super recruiting class coming in and Jalen Hudson coming back. 22. UCLA. Another stellar recruiting class by Steve Alford may help offset the loss of do-everything guard Aaron Holiday. 23. Arizona State. The Sun Devils’ guard trio of Tra Holder, Kodi Justice and Shannon Evans II are gone. Transfers Zylan Cheatham and Rob Edwards will be back, joined by a strong recruiting class. 24. Florida State. The Seminoles made a deep NCAA Tournament run ahead of schedule this season and have high-scoring Terance Mann coming back. 25. Loyola-Chicago. The Ramblers were counted out throughout the NCAA Tournament. That shouldn’t happen again after a Final Four run. Published: April 3, 2018, 11:06 a.m.